The Information and Broadcasting Minister of India Smriti Irani has recently assured that Sanjay Leela Bhansali's much awaited magnum opus Padmavati will not face any trouble on it's release. “I am sure law and order will be under control. The State government will ensure no miscreants disrupt any kind of interaction or display. I don’t envisage any problem. If there is any challenge, the State government will meet it," said Irani according to a report by The Hindu. This statement was made to Karan Johar as Irani appeared on the panel at the World Economic Forum and the answer was in response to a question on the 'political pressure' surrounding the film. 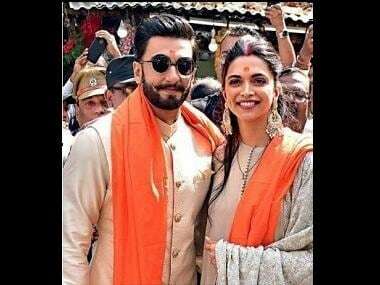 The Deepika Padukone-Shahid Kapoor-Ranveer Singh starrer was promised a smooth release by the government. These questions arise after Bhansali's film saw several protests and outrage against it over it's depiction of characters of historical importance. The Shri Rajput Karni Sena, an organisation of the Rajput community burnt posters of Bhansali's movie in Jaipur recently, while a few months ago (January), as the shooting was underway, the activists of Karni Sena assembled at the Jaigarh Fort and held a demonstration. Some of them also tried to vandalise the set. Another update from the world of Padmavati is news that Singh and Bhansali will be shooting a song for which Singh is rehearsing with choreographer Ganesh Acharya. “The song is going to be bigger than any of the Sanjay-Ranveer combination songs that have been done before. The poster, which was unveiled on social media recently, was just a glimpse, this song is going to be killer and bigger," said an unverified source according to a DNA report. This song will reportedly require 200 back-up dancers. The period war drama Padmavati is all set to hit theater screens on 1 December.